The authors report on a 2002 national survey of mental health mutual support groups (MSG) and self-help organizations (SHO) run by and for mental health consumers and/or family members, and consumer-operated services (COS). 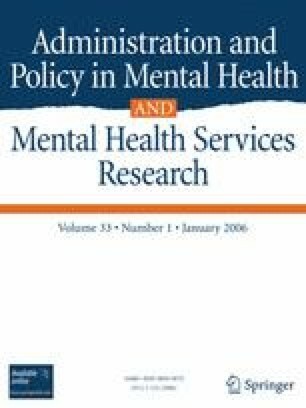 They found 7467 of these groups and organizations—3315 MSGs, 3019 SHOs, and 1133 COSs—greatly eclipsing the number of traditional mental health organizations (4546). MSGs reported that 41,363 people attended their last meetings. SHOs reported a total of 1,005,400 members. COSs reported serving 534,551 clients/members in 1 year. The array of services and supports provided within each of these types (MSG, SHO, COS) is reported, and implications for the President’s New Freedom Commission on Mental Health recommendations are explicated. The authors wish to specially thank Paolo del Vecchio, Risa Fox, Crystal Blyler, and Neal Brown, CMHS, Lisa Famularo (formerly with TNS), and Marie Verna (formerly with the National Mental Health Consumers’ Self-Help Clearinghouse) for their on-going assistance with the CMHS Survey.